Getting to the top can be murder. Strictly Sinatra is one of those nice little off-the-beaten path films that never saw the light of day in mainstream American theaters � at least to my knowledge. 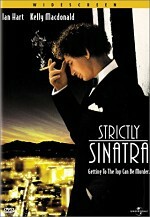 Universal has released the film to DVD under the name Strictly Sinatra rather than the original title of Cocozza�s Way. While either title is appropriate, I assume that the filmmakers assumed that American audiences/DVD purchasers would be more open to a film with the name �Sinatra� in the title. They may be right, but the film is still a pretty tough sell. The film introduces us to Toni Cocozza (Ian Hart), a Scottish crooner and lounge singer who is eternally hopeful (and desperate) for fame and someone with an unhealthy infatuation with Frank Sinatra � so much so that he refuses to sing tunes by any other crooner. Toni, along with his keyboard player Bill (Alun Armstrong), play some rather seedy joints and perform for indifferent and unresponsive crowds who could care less one way or the other who they are or whose music they play. That all changes one night as he gets an audience request for an Elvis song. His manager informs him backstage before he goes back on and Toni initially refuses. 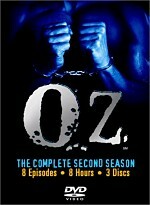 He then learns that the requestor is a feared member of the Irish Mob (Iain Cuthbertson) and reluctantly, Toni complies. When he�s done, the mobster and his wife, Dainty (Una McLean), invite him over to their table and thank him for the song and shower him in compliments about his singing ability. 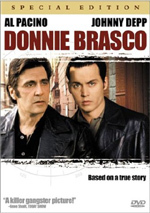 Toni supplies the couple with a copy of his tape, �Strictly Sinatra�, on their way out the door and the mob boss offers Toni a job singing at one of his casinos in the area. Toni is left with an enduring impression of power and wealth from his meeting with the mobster and sees his invitation as a shot at fame and fortune. Bill warns Toni that it will only be a matter of time before the mobsters want something from him and to not take so much as a drink from them if given the chance. Well, the chance presents itself down the road as Toni is meeting with one of the mobsters, Chisolm (Brian Cox), and oddly enough, he�s offered a drink. The second Toni takes a sip of the bourbon and sets his drink back down on the table, Chisolm asks him for a favor. Toni, feeling somewhat indebted to the mobsters, reluctantly agrees. Soon, Toni is forced to involve himself in all sorts of crooked and devious deals and finds himself way in over his head. His girlfriend, Irene (MacDonald) sees what is happening to Toni and is threatening to leave him. 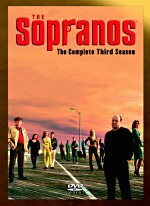 Toni is psychotically drifting back and forth between reality and a fantasy world of his own making and after realizing that he�s becoming too wrapped up in the mobster lifestyle, he realizes he has one chance left to leave and in order to pull it off, he�s going to have to give the performance of a lifetime. Other characters in Strictly Sinatra shine as well as Brian Cox plays Scottish gangster Chisolm, a calculating and controlling mobster who spins marvelous tales of Sinatra and Las Vegas that keep Chisolm riveted on his every word. Tommy Flanagan�s brute portrayal of Michelangelo was well received, as was Kelly MacDonald�s warm performance of Cocozza�s romantic interest, Irene. Director/Writer Pete Capaldi has done an interesting job of adding a new twist to the gangster genre and while I didn�t find myself continually entertained by the film, I enjoyed the twists and turns that were offered up. Strictly Sinatra takes a little time for the casual viewer to get comfortable with and while there are dozens of films superior in the genre, it�s nice every now and again to get out of your comfort zone and get a taste of a new take on an old genus. Strictly Sinatra is definitely not for everyone, but was enjoyable enough that it deserves a rainy day look from those of you who enjoy expanding your horizons somewhat. Universal offers up Strictly Sinatra in an anamorphic widescreen transfer that is presented in its theatrical aspect ratio of 1.85:1 and while the image isn�t completely clean, it looks quite good when stacked up against films with much larger budgets. The image was quite sharp and detailed throughout, with only the occasional scene littered by some slight grain and/or imperfection. The film�s color palette was accurate, but lacked any overly impressive hues that stood out one way or the other. While the interiors of the clubs were quite bold and colorful, it wasn�t so drastic that you really found yourself impressed one way or the other. Strictly Sinatra contained some rather strong black levels however, as the low-light sequences never exhibited any break-up or muddiness, although some of the scenes shot in the smoky, low-lit nightclubs did seem to contain a slight amount of grain that caused the image to go slightly soft. The film seemed to be properly balanced and saturated, with no smearing or oversaturation noted at any time. Edge enhancement was noticed on a couple of occasions and print flaws were spotted, but were few and far between. Ultimately, none of the issues mentioned distracted from the film in any way. Universal has done a fine job with the video transfer on a somewhat obscure film and while most won�t care, the results are quite pleasing. Universal presents Strictly Sinatra in a Dolby Digital 5.1, as well as a DTS 5.1 transfer. Neither mix is memorable, as the film itself limits their achievements from the get-go and Strictly Sinatra remains a dialogue-driven affair. While the name �Sinatra� is prominent in the film�s title, don�t be fooled into thinking that music plays a big role in the proceedings. While there are admittedly a few tunes littered throughout the film here and there, it�s definitely not enough to be considered a prominent feature. Even so, the musical portions of the film are the only ones that utilize the surrounds to any degree. As I stated in the previous paragraph, the film was very much dialogue-driven and remained firmly anchored in the front soundstage, while the music and score displayed much more impressive dynamics and fidelity. Effects, while minimal, sounded quite natural and came from their proper place within the soundstage, as LFE usage was minimal at best. While Universal�s transfer isn�t a bad mix by any means, it�s a very unassuming and nonspecific one by most standards. As far as the Dolby Digital and DTS options are concerned, it�s a toss-up between the two, with the Dolby Digital option being my personal preference. While I�m normally a DTS snob, it seemed that the DTS volume levels were a bit uneven, as the music really seemed to overpower the dialogue when it came in to play. The Dolby Digital transfer didn�t seem to exhibit this anomaly and therefore was a bit more pleasant � especially considering that Strictly Sinatra was a rather bland affair to begin with. Universal�s mix ultimately ends up being pleasing � although very workmanlike - and the studio has included a Dolby Surround track in French, as well as English Closed Captions and Spanish subtitles to accompany the film. Universal has provided no extras for Strictly Sinatra � not even a trailer � and while it�s unfortunate, it�s doubtful many will care. Strictly Sinatra is slightly misleading and doesn�t completely succeed as a �gangster film� - although that�s the one genre it feels most comfortable in. It also has the production values and the look-and-feel of a made-for-TV film and never really gets a complete buy-in from the viewer as a major motion picture event. Even so, it�s worth a rental if nothing else. With the price of Universal�s DVD, as well as the lack of any extras, it�s hard to recommend this as a sight unseen purchase. Even with the solid A/V specs, the film simply doesn�t warrant a buy. Check it out first and go from there.